It's 20 years since the release of Dayglo Fishermen's now classic pop album 'Painting Aliens'. Written, produced, engineered and released over the course of only one year, the album is a remarkable blend of the band's unique quirkiness with traditional pop. For many the album is quite simply Dayglo Fishermen's finest collection of songs ever. 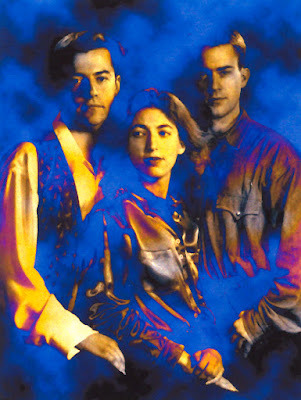 The CD cover image for the 'Painting Aliens' album. It was designed by former band member David Fothergill. Almost immediately after the release of their album 'Space Dog' in August of 1997, and no doubt on a high from that album's reception and success, the band reconvened in Opium Studios, their main production facility at the time. With intense focus, and with the level of creativity at its most potent, several tracks were recorded within just a couple of months, including 'Love Rescue Me', 'Voodoo' and 'Circus'. 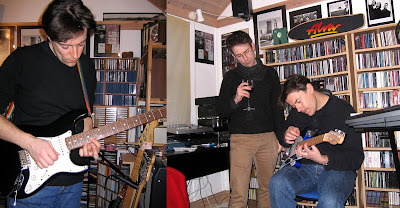 The new album was rapidly taking shape. Its feel and direction were clear. In early 1998 production had to be halted for a while as the band and its equipment moved to a new recording facility, Aqua-Lisa Studios. 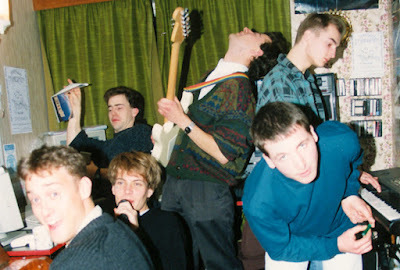 The band used that downtime to organise a photo shoot for the new album's cover. Moving to a new recording facility was a risky move while in the middle of a production; one that had the potential to disrupt the creative flow. But fortunately it seemed to have quite the opposite effect. 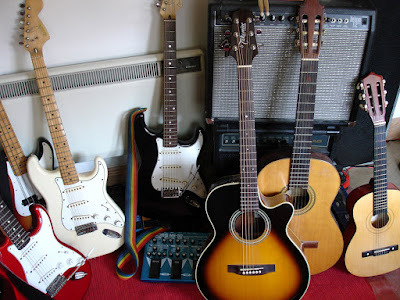 A desperate desire to get back to writing and recording resulted in another couple of months of frenzied work, with the likes of 'Something's Watching', 'Underground' and 'Passion' created during this period. 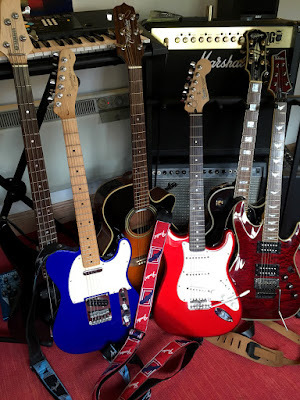 By the time summer arrived the music for the album had been completed. The band contacted former band member David Fothergill and asked him once again to design the cover. The design he created was a perfect fit for the songs, and has become as iconic as the music itself. 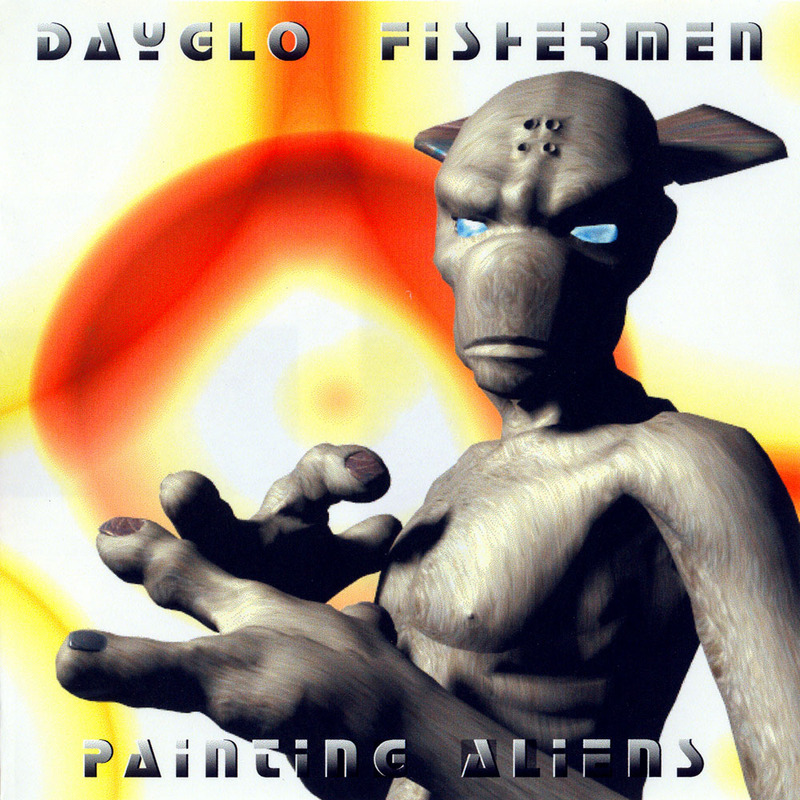 In August 1998, exactly a year after the release of 'Space Dog', Dayglo Fishermen released 'Painting Aliens'. It was a remarkably fast turn around, and yet the 13 tracks on the album feel in no way rushed. The album received immediate praise, and it is now generally accepted to be one of the band's most finely crafted collections of music. Calls were once again made for Dayglo Fishermen to perform live. Six months later those calls were answered. The 'Painting Aliens' concert tour started in February 1999 at the Rock Garden, a subterranean venue in London's famous Covent Garden. Dayglo Fishermen performing at the Rock Garden, London in February 1999. It was the first concert of the 'Painting Aliens' tour. This image shows the band in the closing moments of what was a truly epic performance of the song 'Voodoo'. 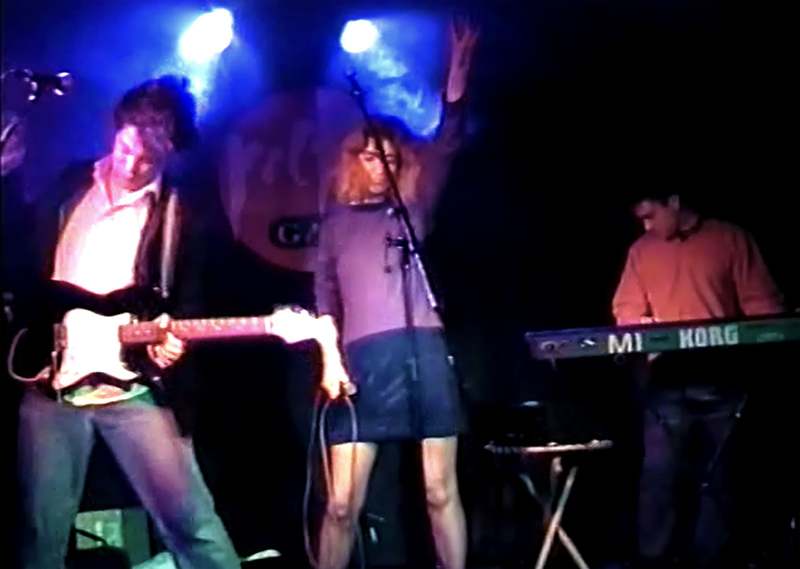 The final concert of the tour took place in October 1999 at The Garage, in Buckinghamshire, very close to the band's primary production facility. It was an intimate and private affair, with specially invited guests only: a fitting way to end the album's promotion, and the perfect way to thank the band's closest supporters. The album's title track, 'Painting Aliens', starts things off. 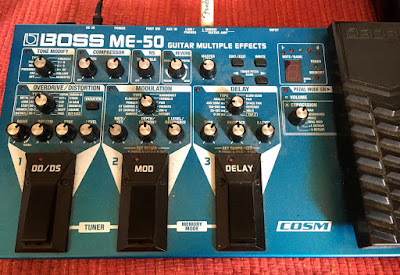 It was written late on in the production process and is an energy-packed and instantly appealing sci-fi themed song tinged with the expected Dayglo Fishermen oddness. The song is about an alien that visits Earth in a red and blue saucer ship. The alien reveals he has learned our language from our books: not the easiest way to do it when you're not on this planet. And he also knows how to cook. He eventually takes someone for a ride in his saucer, leaving them in a daze. It's a light, catchy and amusing way to begin the album. And things only get better. The second song, 'Underground', maintains the tempo but alters the mood significantly with a much denser sound. The track begins with a rough distorted keyboard sound, accompanied by a mournful guitar. The rhythm soon kicks in and a strong synth bass and chugging guitar grips the listener as the verse begins. The following chorus oozes smooth power as the now echoing vocals become serious and determined. And if that isn't enough, the middle section contains what is probably the most intense and dramatic keyboard solo in the band's history. It's no wonder that this is the most eagerly anticipated track whenever the band play live. 'Something's Watching' slows things down a bit, but despite its highly melodic nature there is still an air of tension as the song's subject matter - paranoia and alien impregnation - mesmerises the listener. The percussion is light but relentless, and is accompanied by a smooth bass and a gentle guitar line. As the verse progresses subtle pitch-bended keyboard sounds are introduced in the background, enhancing the sense of eeriness. 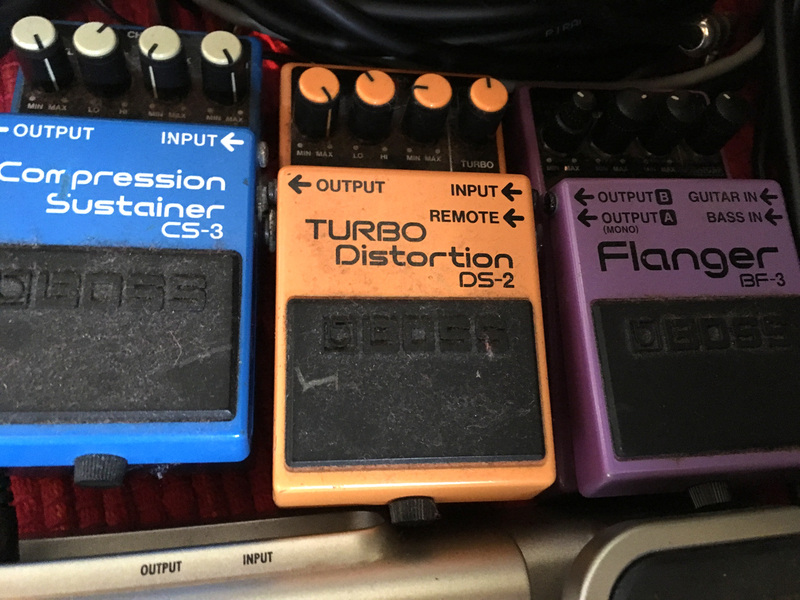 Sliding guitars in the chorus boost that sensation even further. It's easy to see why this song has become one of Dayglo Fishermen's most popular tracks, and one that's been performed live at every concert since its release. The next track. 'Blue', lightens the mood significantly. The brushed drums, plucked bass, acoustic/electric guitar mix and electric piano give the song a soft Jazzy feel, with Ginny's confident and gentle vocals lifting things up to something that is truly pleasant. The track gives the impression that the album is switching direction to something happier and more carefree. But that is not the case. 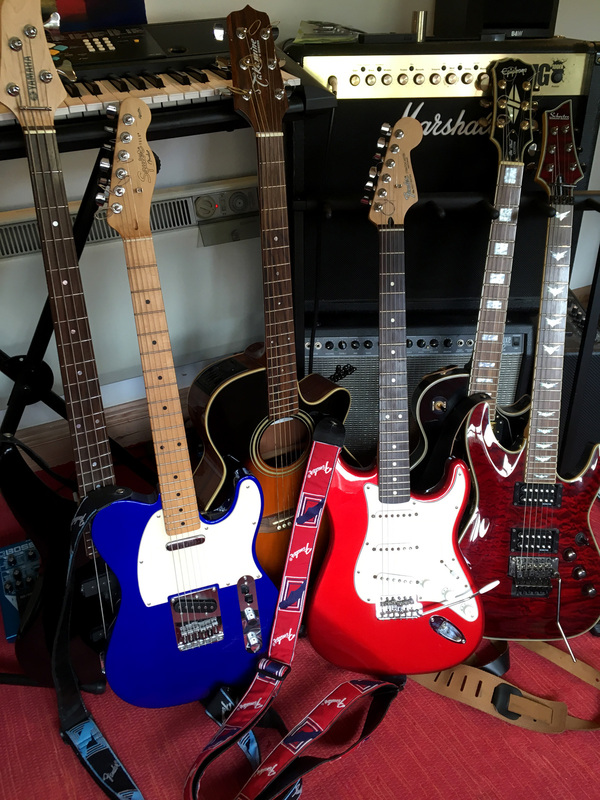 Deep strings and a distant distorted guitar herald the start of 'Voodoo', a re-recording of a song the band originally released on their eponymous album, 'The Dayglo Fishermen', five years earlier in 1993. This version feels much more orchestral as the rich keyboard string section leads the listener through the entrancingly sung verses and choruses, all accompanied by heavy drums and a rich bass line. Dropping right down to almost nothing, the middle section slowly builds to an epic keyboard and guitar solo leading into the final chorus. It's a magnificent experience. 'Appetite' comes next, and is actually a re-working of the song 'The Sense of You', which featured on one of Richard and Peter's other works titled 'After the Storm', released in 1992. It's an enticing and joyful high-tempo track with punchy drums and bass. Light guitar and a dominant piano riff fills the chorus and the lengthy middle section, which at times seems to drift into a Latin feel. It all results in a positive and fun piece of music. There are many aspects of circuses that are often considered disturbing (clowns in particular). The next track, 'Circus', seems to capture that feeling quite well. With a very light up-tempo feel the verse starts things off nicely enough, accompanied by soft vocals. But the chorus that follows descends into something quite threatening as harsh guitars, an unnerving synthesiser riff and a forceful vocal performance change the mood significantly. 'Circus' was performed live only once at the Redeye in Islington, London in early 1998 as part of a short preview concert for the album. 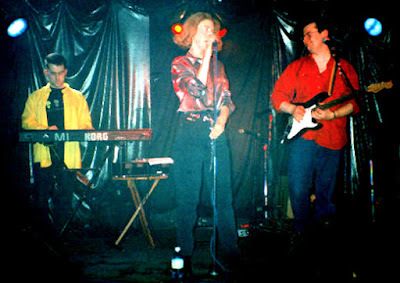 The only known images of Dayglo Fishermen performing at the Redeye in London in February 1998. The exclusive event was a preview concert for the 'Painting Aliens' album, which was released six months later. The songs played were 'Love Rescue Me', 'Appetite', 'Blue', 'Voodoo' and 'Circus'. 'Love Rescue Me' is an edgy high tempo song. Its straight but powerful drum track races along with synth a bass that pulses in from nowhere to complete each bar. The guitar is particularly good, with distant arpeggios and staccato power chords in the verses. A pitch-bending keyboard riff sits ominously behind the vocals in the chorus, with more distant guitar finishing things off. This song was written very early on in the production of the album which is why it would have been a good fit for the previous album, too. It has a sound that seems to straddle both. Songs about predatory females are not common, so the next track, 'Sharks', is a welcome addition to the genre. With its squidgy bass sound, electronic drums and its spooky goings-on in the background, the song paints an eerie picture in the listener's mind. Its message is basically beware, be wise, and know what you're getting yourself involved in - important in all aspects of life. After this, the third rather tense track in a row, it would be right for things to lighten up. 'Foreign Affair (JS Bach)' is one of the gentlest songs that the band has ever written, and it comes at just the right moment on the album. Its soft percussion, which ebbs and flows beneath the melodic guitar arpeggios, perfectly complements the beautifully sung vocals. Underpinning all of this are mellow and wispy keyboards sounds, with a swelling synth lifting the middle section. There's an unexpected and almost groaning keyboard sound ever-present right in the background. It's a subtle touch that completes what could be considered the perfect song to drift away to. The band raided Richard and Peter's other work once again for the next song - a new version of 'Another World', featured on the 1990 album 'Love's a Dangerous Language'. With its title shortened to 'World', the track oozes menace from the outset; an almost shocking contrast to the previous song. A punchy bass and a powerful synth line start things off, with a simple and relentless drum track pounding throughout. Dense distorted guitar fills the background. Richard's incredibly rough vocal fits the verses perfectly, with Ginny taking over for the choruses. The track develops some space towards the end, and then fades out: a rare event on a Dayglo Fishermen song. The penultimate track on the album is widely considered to be the band's dance floor classic. 'Passion' wastes no time in getting down to business. Its deep bass, orchestral stabs, electronic drums and sensual and suggestive vocals entrance the listener with immediate effect. Subtle guitar licks skirt around the soundscape, turning into an echoing riff as the chorus take hold. It's an energising experience, and the song is demanded for every Dayglo Fishermen performance. The reaction of audiences whenever it's played makes it easy to understand why the band are more than happy to oblige. Dayglo Fishermen excel at instrumental tracks, and 'Irritating Cliché', the final track of the album, marks a welcome return to such compositions after being noticeably absent on 'Space Dog'. 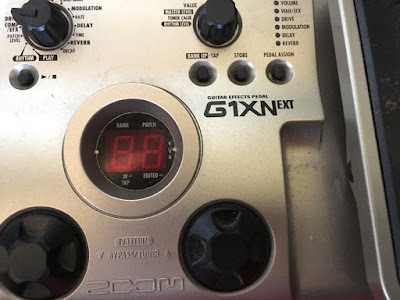 A rough breathing sound introduces us to a gradually building symphony of breathy keyboard sounds. This is soon joined by a fast percussive sequence, and string sounds are quickly layered into the mix. At the halfway point this all drops away and is replaced by a soft synthesiser pad and mellow, almost melancholic, guitars. This continues, building once again, until the breathing returns and the track finishes as it starts. A sudden and perfect way to end the album. Those who have heard 'Painting Aliens' would be forgiven for thinking that Dayglo Fishermen had sold out to commercialism, and that the band were chasing some easy hits and even adulation. But there's nothing to suggest that in the production notes. The band were simply writing and recording what they felt like doing, just as they always have and always will. Nothing was contrived. Nothing was planned. Each track on the album is of its time: created in the moment, and for that moment. And what a fine collection of moments that turned out to be. When it comes to locations for band photo shoots Dayglo Fishermen almost always chose somewhere local to where they are recording or performing. There is never a desire to go anywhere even remotely exotic. 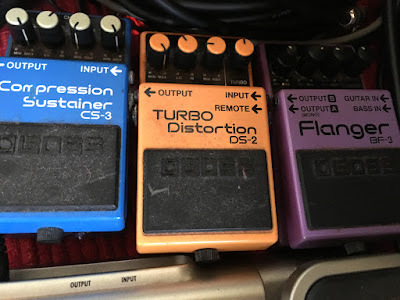 The band likes to keep things authentic and maintain as close a connection as possible to the music. 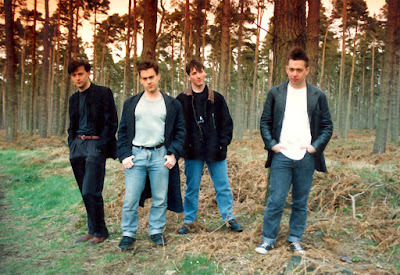 During the band's early years, from 1990 to 1994, there was one location in particular that Dayglo Fishermen visited for photo sessions: the woods on a hill to the west of Hexham, Northumberland, just a short walk from what was then the band's only production facility: Artlite Studios. The first major shoot in those woods was in early 1992 during the recording of the 'Magic Organ' album. The photographer, Mark Chapman, masterfully captured the tension of the music and the mood of the band, with the straight and almost bare trunks of the trees in the background adding a level of bleakness and melancholy to the scene. The official photo from the first Hexham woods shoot in 1992, taken during the production of the 'Magic Organ' album. From left to right: Peter Fothergill, Sean Wills, Richard Burton and Eamonn Maddick. Another photo from the 1992 shoot. 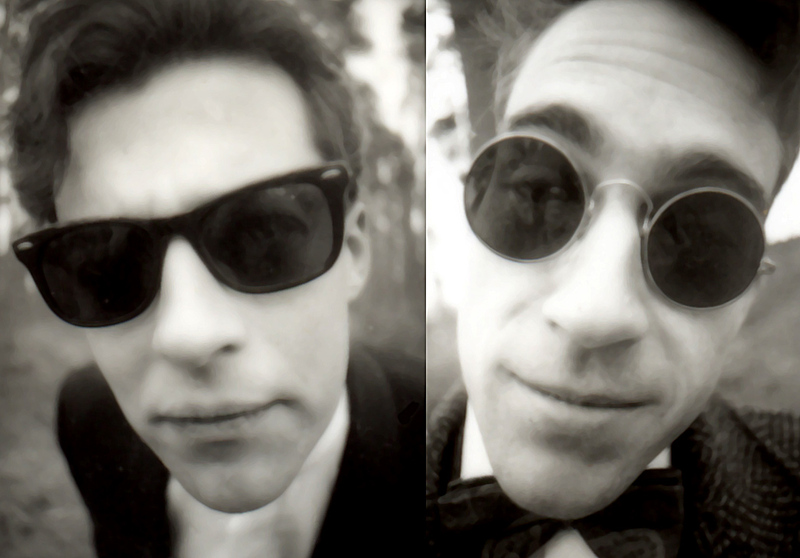 The second major shoot was a year later in early 1993. Dayglo Fishermen now consisted of just Peter and Richard, and the shoot was for the cover image of the forthcoming album 'The Dayglo Fishermen'. The photographer, J. Lorne Inglis, needed to create a lighter and more contemplative impression, and he succeeded. 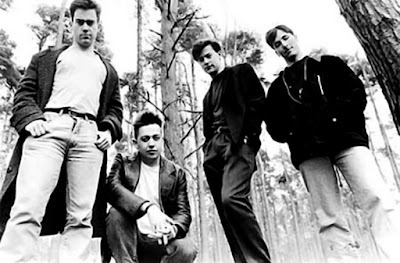 The resulting photos, especially the one finally selected for the cover, illustrate the dramatic change of mood in the band from the previous year. It was a perfect complement to the album's music. The photo chosen to feature on the cover of the band's 1993 album 'The Dayglo Fishermen'. 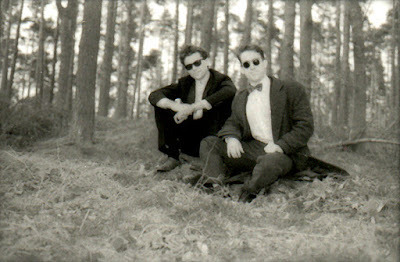 Peter Fothergill (left) and Richard Burton. The chosen photo as it appears on the 'The Dayglo Fishermen' album cover. Design by J. Lorne Inglis. 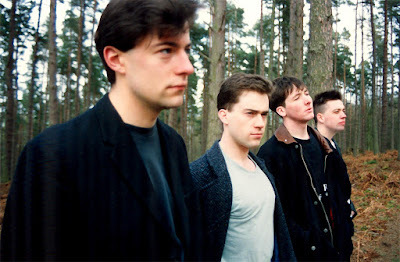 Within a couple of years of that 1993 photo shoot the woods were cut down. The landscape became truly desolate, but it may well have appealed to Dayglo Fishermen had they not long since moved south to a slightly warmer climate. The woods, so I'm reliably informed, were soon replanted and have since grown back to their former glory. If the band becomes nostalgic perhaps they'll be found in those woods again one day. 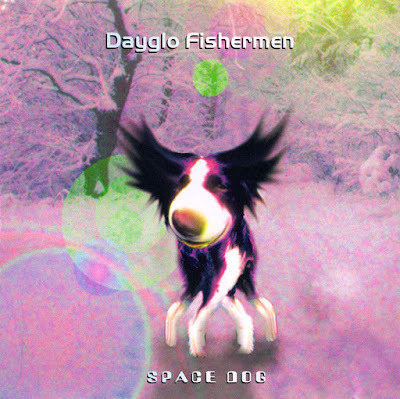 The summer of 2017 was the 20th anniversary of the release of Dayglo Fishermen's 'Space Dog' album. The anniversary passed without fuss, which is a shame as the album was a significant milestone in the band's history and development, and something well worth celebrating. Now is certainly a good time to look back on how that album came about. In late 1994, following the release of their album, 'Hocus-Pocus', other commitments forced Dayglo Fishermen to place all production on hold. 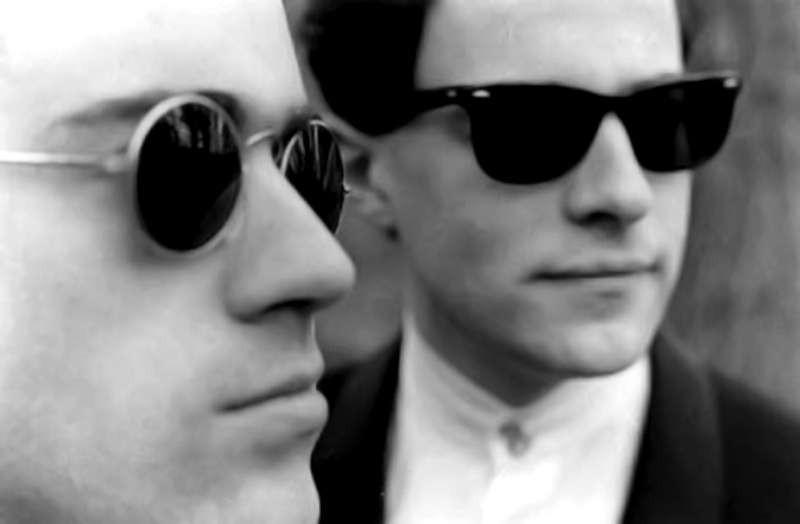 The two band members, Peter Fothergill and Richard Burton, were heading south to London, and their Northumberland production facility, Artlite Studios, where the band's first 11 albums were recorded, had to be closed. 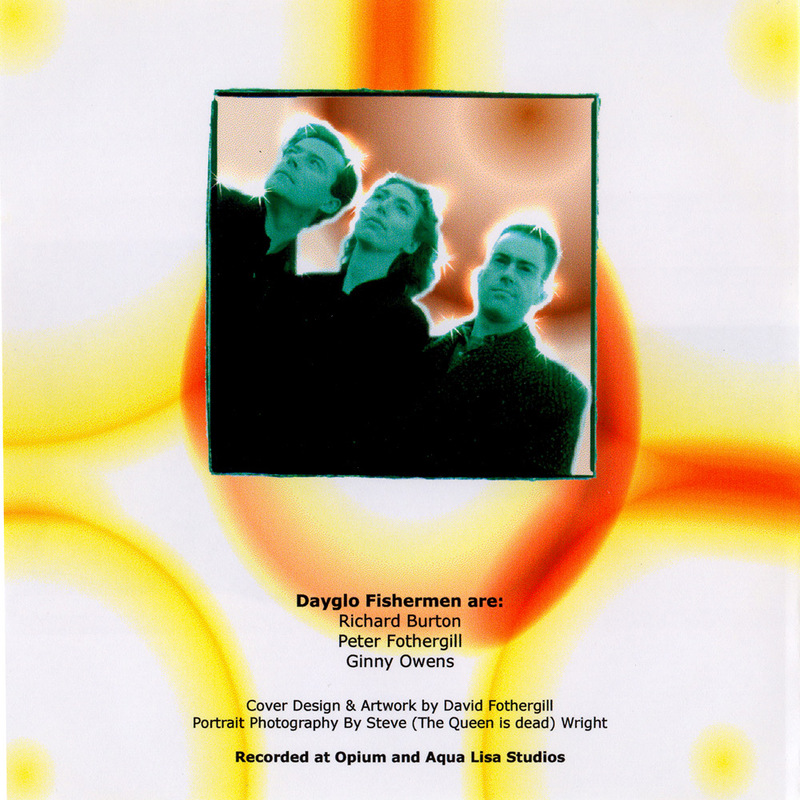 It was not until March 1996, 17 months later, that Dayglo Fishermen began working on their next project, this time in their new Buckinghamshire production facility, Opium Studios. More importantly, though, the band had recruited a new lead vocalist, Ginny Owens. Ginny was not given much time to settle in. A few months after she joined the band they performed live at The Garage, a small private venue not far from the band's production facility. Unusually the audience was given a sneak preview of some of the songs already completed for the new album. It was no doubt a tantalising event. A rare image of the band performing at their first 'Garage' concert. It is the first time Ginny performs with the band. The select audience was treated to several songs from the unreleased 'Space Dog' album. With the release of the album approaching the band arranged a photo shoot. It was very formal, conservative, and even a bit sombre considering its purpose. It was not at all what would be expected. Perhaps that was the intention: to confuse and surprise, even to shock. Following the photo shoot, former band member David Fothergill was asked to design the cover image and inserts. An image he had designed the year before, showing an unusual dog in a snow-covered country lane, was chosen for the front cover. It was that image that gave inspiration for the album's unusual title. 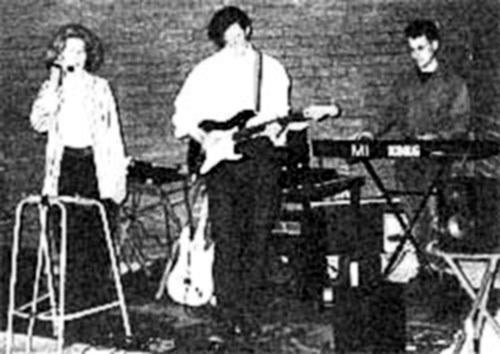 Dayglo Fishermen performed another live concert in the spring of 1997 at the Rock Garden in London's Covent Garden. Again many of the new songs were played, including the recently completed title track, 'Space Dog'. Dayglo Fishermen performing at The Rock Garden in London during March 1997. The gig was largely a preview concert for the 'Space Dog' album (released several months later). Songs performed included 'Under the Water', 'Worlds in a Room', 'Turn You On' and 'Space Dog' (which was the opening track performed). After a year and a half in development, and after being digitally mastered (a first for the band), the 'Space Dog' album was released during the summer of 1997, and for the first time a Dayglo Fishermen album was available in CD format, as well as cassette. Composed to accompany the iconic album cover image, the opening track 'Space Dog' is an epic song about an awe-inspiring, reality-splitting and space-travelling dog. The dog arrives on Earth in England during the depths of winter. She travels to the far north of the country, apparently having a great time, and then heads back into space to continue her interstellar quest, the nature of which is never revealed. The song begins with a slow countdown, and then a hard rhythm kicks in, accompanied by guitar and a rather grungy keyboard riff. The mid section drops down to drums and guitar for a while, before building up to a new synth arpeggio and guitar solo. This is followed by a verse filled with a sample of the NASA radio conversation with Neil Armstrong as he prepares to step down to the Moon's surface. Perhaps it's that transmission that Space Dog detected, and which persuaded her to head in our direction. At almost eight minutes long the song is the longest track on the album, so starting with it could have been an unwise decision. Fortunately the track is one of the album's most memorable. It's a fine way to kick things off. The much lighter-feeling 'Turn You On' comes next. It is catchy pop song, dominated by melodic bass and guitar, and punchy drums, with organ keyboard sounds lifting the chorus. The song is an ideal live track, and was performed many times, including at the first Limelight Theatre concert in 2008. 'Worlds in a Room' brings the tempo of the album right down. The verses are mellow, with a gentle chugging guitar, soft keyboard tones, and Richard's spoken and almost whispered vocals. But the softness vanishes in the chorus. Sustained and distorted guitar, accompanied by a rather sinister synth line, fills the soundscape. Ginny's vocals take over the chorus with the now classic line 'I surrender to you, I give you all I can'. This song works particularly well played live, and has been performed several times, including at all of the band's Limelight Theatre concerts. The tempo stays low for the next track, 'Fly in the Wind'. But, perhaps thankfully, the tension has all but gone. Despite a decent dose of melancholy, the track manages to relax the listener with its smooth guitar and mellow synth brass melodies that seemingly drift off to infinity. Ginny's vocals enhance that effect even more, and exhibit a fragility that she would come to develop and use to great effect on later albums. There are actually two earlier versions of this song, both of which were featured on the 'Animate' album in 1993. Coming next is 'Things Fall Apart (The Centre Cannot Hold)'. Edgy and mildly disturbing, it builds slowly from a repeating synth, adding drums and then bass and then guitar, and finally vocals. Feelings of menace and even dread are evoked as the hypnotic rhythm grips the listener to the end. It's quite a contrast to the previous song, and perfect preparation for the next. Continuing on from the edgy and menacing feel of the previous song, 'Under the Water' starts with a tense siren sound before launching straight into a heavy rhythm. Soft and distant synth melodies add to the atmosphere, with occasional calmer sections of electric piano providing a respite from the tension. The song is one of the standout tracks on the album and has been performed live several times. 'Cool' is a melodic mid-tempo song that sits well at the album's halfway point. The song seems to be about someone experiencing a form of extended consciousness, or at least some wild visions. As the song progresses things get even stranger, with mention of 'The Guardians' (perhaps the same ones mentioned seven years earlier on the song 'Easy Projector') and a golden dome. Interesting. Very interesting. A smooth synth bass line kicks off 'Half Moon Junction'. It's a light mid-tempo pop song with Richard singing the verse and Ginny taking on the chorus. The middle section drops down to a swelling synth pad before the rhythm and guitar return, culminating in an unexpected pan pipe solo. The track has a very clean and refreshing sound to it, and certainly deserves its place on the album. Dominated largely by a continuous and heavily reverberated piano line, 'Diving For Pearls' brings the tempo and mood right down. It's Richard''s turn to demostrate fragility as his vocals convey an impressive sense of suffering. As the song progresses the soundscape is developed by deep and echoing sounds. A gentle synth brass sound - a common theme on the album - fills the middle section. Distorted guitar makes an appearance in the closing moments of the track, rightfully kept in the background as the piano plays its final notes. Although appearing towards the end of 'Space Dog', 'Shadowlands' was the first song to be recorded for the album. Most notably though, it is the first ever Dayglo Fishermen song to feature Ginny's vocals. The track begins with mellow synths and guitars, and then a gentle vocal by Richard eases us into the first verse. The first chorus erupts with drums, bass and piano, with Ginny's voice taking control. It's a simple and melodic composition that sits well within the distinctly lighter second half of the album. The next track is 'It's Only Pleasure', which is actually the third incarnation of the song. 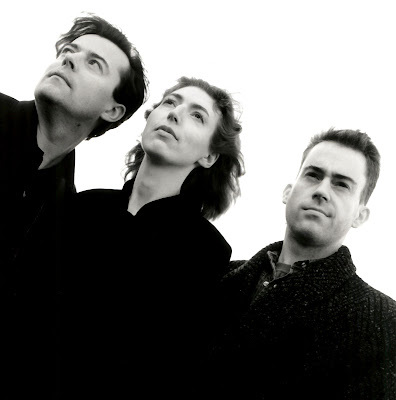 The first version of the song appeared in 1993 on the 'Animate' album. Its catchy delayed synth and guitar riffs proved so popular with the band that a new version was recorded for the 'Hocus-Pocus' album the following year. This latest version rides on the success of the first two with a simpler and less delayed arrangement. A worthy addition to the album. Adding '2000' onto the name of things seemed to be a fashion in the nineties, and Dayglo Fishermen follow that trend here. 'Minneapolis 2000' is remake of 'Minneapolis' which featured on their 1994 album 'Big Spoon'. Everything about the track is pleasant, from the smooth keyboards to the silky deep bass and the gentle guitar. Unlike the original, which featured the casual ramblings of a native Minnesotan, this version paints a lyrical picture of the city of Minneapolis, including a reference to the Claes Oldenburg sculpture 'Spoon Bridge and Cherry' situated in the Minneapolis Sculpture Garden, an image of which was used on the 'Big Spoon' album cover. A reference is also made to 'The Tower' (known officially as the 'IDS Center'), which is actually the skyscraper on which 'DGF' is written on that same album cover. The album finishes with 'Close Your Eyes'. It's a simple and mellisonant track, most notable for its frail and nervous vocals sung by guest artist Kate Archibold. The song was not originally recorded for this album, but for Richard and Peter's other work, 'Opium', in 1994. This is that exact same version. According to the production notes Kate was not used to singing in a studio environment so the nervousness in her voice is probably genuine, which makes the song all the more endearing. It's interesting to note that there is actually an earlier version of the song. The original version of 'Close Your Eyes' was released in 1992 on the album 'After the Storm', another of Richard and Peter's other works. That version features Richard's voice, is much longer and consists of a more complex arrangement. It was certainly wise to create more space in the instrumentation for Kate's voice in the later version. I've left 'Night Boat to China' until last. It was not included on the original release, the reasons for which will become obvious if you listen to it. It was later added as the album was made available to download. At over seven and a half minutes long 'Night Boat to China' is the second longest track on the album. It excels in monotony, but it can actually be quite hypnotic if listened to in the right mood. Amazingly the song was the first song played at one of the Garage concerts. Worth a listen, though perhaps just one time. The 'Space Dog' album was the beginning of a new era for Dayglo Fishermen, an era of more structure and polish, and of more considered orchestration. It saw what appeared to be the end of the band's wild experimentation, and with it the apparent loss of innocent fun. But actually the band had simply evolved and steered itself in a new direction. The band were now operating on a completely different level. 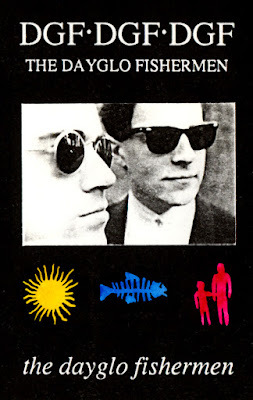 The album demonstrated that Dayglo Fishermen had not lost any of their creativity or passion - far from it, and it laid the groundwork for what was to come: a series of intensely original and professional collections of work with a maturity rarely apparent on the early albums. That space-faring canine is to be saluted. Long may she roam the galaxy.